Which of the following respiratory structures is more commonly known as the "throat"? What is the amount of air that can be exhaled with the greatest possible exhalation after the deepest inhalation called? Which of the following are the two main functions of the larynx. a. To provide a patent airway; to act as a switching mechanism to route air and food into the proper channels. c. Voice production; to act as a switching mechanism to route air and food into the proper channels. The _________________ is also known as the "guardian of the airways". The smallest subdivisions of the lung visible with the naked eye are the _____________, which appear to be connected by black carbon in smokers. Chemicals that enhance urinary output are called _______________. Which of the following is not one of the things that must happen for micturition to occur? Most solutes that are reabsorbed in the proximal convoluted tubule use which of the following pathways? **Yes, most substances are reabsorbed first through the luminal and then through the basolateral membranes of the proximal convoluted tubule. During reabsorption of water in the proximal convoluted tubule, what causes water to diffuse from the lumen into the interstitial space? **Yes, the increase in osmolarity causes the water to move into the interstitium. The decreased intracellular concentration of sodium in tubular cells during active transport is caused by which of the following mechanisms? **this pump moves sodium out of the cell into the interstitium, thus decreasing intracellular sodium. The active transport of which ion out of proximal convoluted tubule cells causes the reabsorption of both water and solutes? 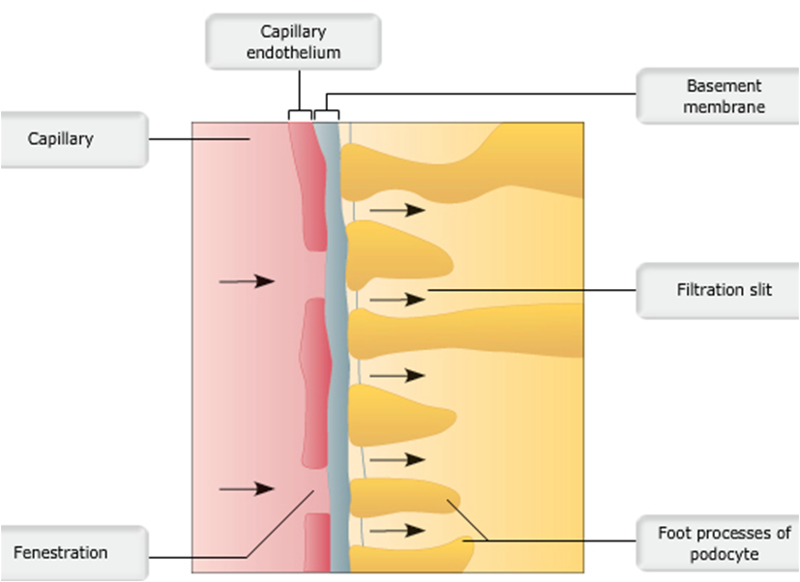 **the active transport of sodium out of the cell, across the basolateral membrane into the interstitium, provides the driving force for reabsorption of both water and solutes. Which of the following transporters in the luminal membrane results in secretion? **because this is a countertransporter, Na+ is transported into the cell and H+ is transported out of the cell into the lumen. What is the limiting factor for the reabsorption of most actively transported solutes in the proximal tubule? **the number of carriers is the rate-limiting factor. For example, in Diabetes Mellitus, plasma glucose levels are very high, and the sodium-glucose transporter cannot transport (reabsorb) all the glucose passing through the proximal tubule. Glucose is therefore found in the urine. Which of the following substances is not normally found in filtrate? **both blood cells and large particles, such as proteins, are not allowed to filter through a healthy glomerular membrane. 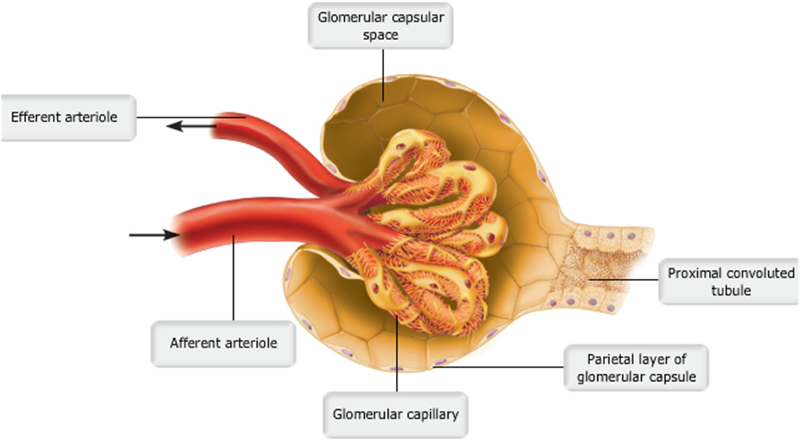 What is the primary driving force (pressure) that produces glomerular filtration? **the hydrostatic pressure of blood forces fluid out of the glomerular capillaries. Which of the following would only be found in the glomerular filtrate if the glomerular membrane were damaged? **large proteins are not normally filtered by a healthy glomerular membrane. If the osmotic pressure in the glomerular capillaries increased from 28 mm Hg to 35 mm Hg, would net filtration increase or decrease? **because osmotic pressure opposes filtration, increasing osmotic pressure would decrease net filtration. Calculate the net filtration pressure if capillary hydrostatic pressure is 60 mm Hg, capillary osmotic pressure is 25 mm Hg, and capsular hydrostatic pressure is 10 mm Hg. **60 – (25 + 10) = 25 mm Hg. The two pressures that oppose filtration must be subtracted from the force favoring filtration. The _____________ collect(s) urine, which drains continuously from the papillae; the urine is then emptied into the ______________. Approximately 80% of the energy used for active transport is devoted to the reabsorption of _______________. What is the largest component of urine by weight, other than water? 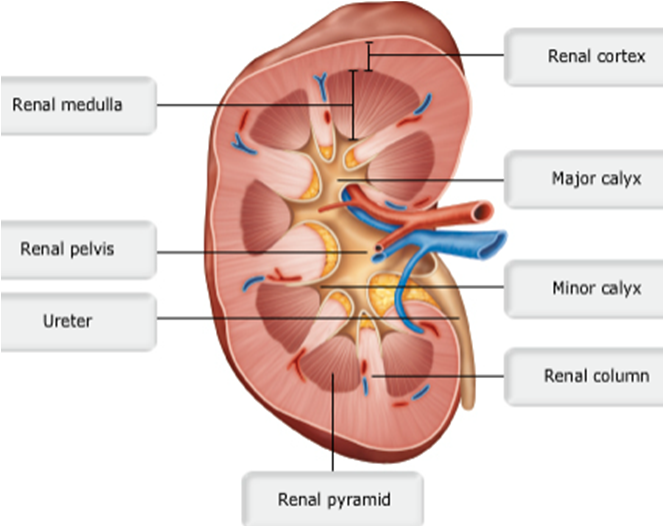 In which part of the kidney is reabsorption (1) dependent upon the body's needs at the time, and (2) regulated by hormones? Which of the following is not a function of the kidneys? Which of the following best describes glomerular filtration rate (GFR)? Fluid and small solutes that leave the glomerulus are collectively termed filtrate. Glomerular filtration is driven by glomerular hydrostatic pressure (HPg) and produces ~125 ml of filtrate per minute. GFR regulation mechanisms primarily affect which of the following? **Much like other capillaries in the body, hydrostatic pressure within the glomerular capillaries produces net outward movement of fluid. Unique to glomerular capillaries, HPg is consistently higher than other capillaries (~55 mm Hg), which ensures the one-way movement of fluid and solutes out of the glomerulus under normal conditions. Which of the following are mechanisms of intrinsic control of glomerular filtration (renal autoregulation)? **Both of these mechanisms occur strictly within kidney (i.e., intrinsic controls). The myogenic mechanism is mediated by smooth muscle within the afferent arteriole. In contrast, tubuloglomerular feedback is mediated by macula densa cells of the juxtaglomerular apparatus (JGA). Macula densa cells of the juxtaglomerular apparatus (JGA) regulate GFR through which intrinsic mechanism? 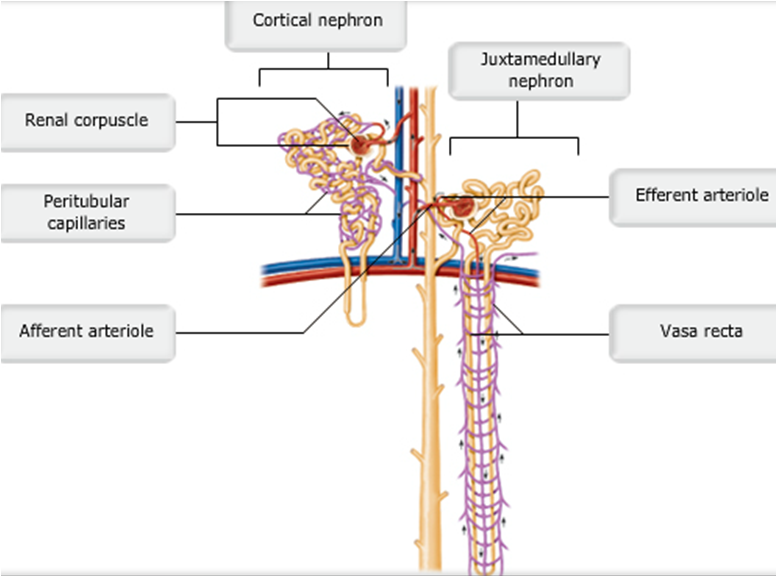 **The JGA is a region of the nephron where the afferent arteriole and its associated tubule are closely apposed. This anatomical arrangement allows macula densa cells to adjust GFR according to the NaCl concentration in filtrate. This is called tubuloglomerular feedback because it allows the contents of the tubules (tubulo-) to affect the glomerular filtration rate. The myogenic mechanism of renal autoregulation primarily involves smooth muscle in which blood vessels? What does a high concentration of NaCl in the renal tubule at the juxtaglomerular apparatus (JGA) most likely indicate? **After glomerular filtration, NaCl is actively reabsorbed at many locations along the renal tubule. If the filtrate is moving through the tubule quickly, less reabsorption is possible, so more NaCl gets left behind. This means that at the JGA, the NaCl concentration within the filtrate will be high. Through the tubuloglomerular feedback mechanism, how would an increase in filtrate NaCl concentration affect afferent arteriole diameter? a. Afferent arteriole diameter would increase. b. Afferent arteriole diameter would decrease. c. Afferent arteriole diameter would stay about the same. **High NaCl concentration in the filtrate at the JGA indicates that GFR is too high. 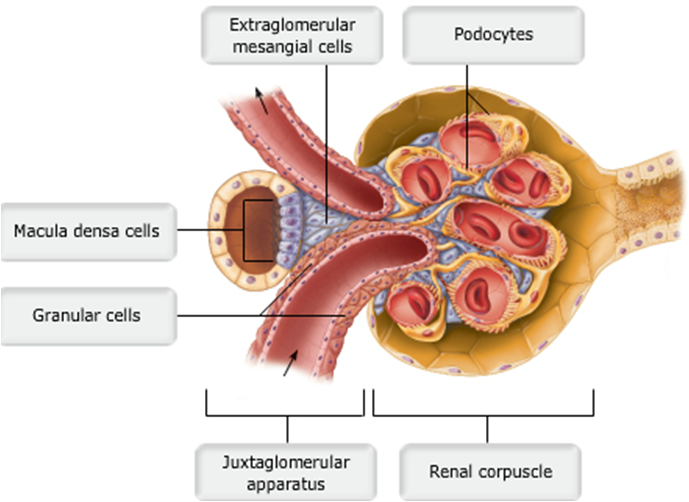 By decreasing the diameter of the arteriole delivering blood to the glomerulus, HPg is decreased, resulting in lower GFR. Granular cells of the juxtaglomerular apparatus (JGA) regulate GFR through which mechanism? **When systemic blood pressure decreases, granular cells release renin which ultimately causes the formation of angiotensin II. Angiotensin II causes widespread vasoconstriction of systemic arterioles and the increase of blood volume due to aldosterone release. 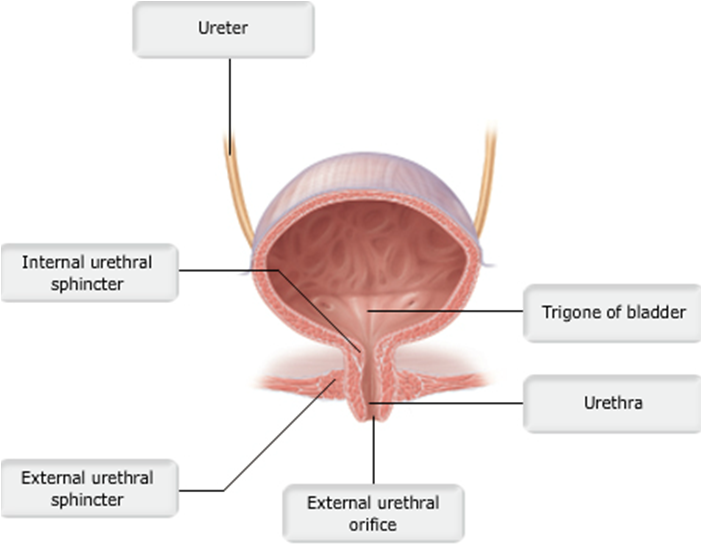 The _______ keeps the urethra closed when urine is not being passed from the bladder, and prevents leaking between voiding. 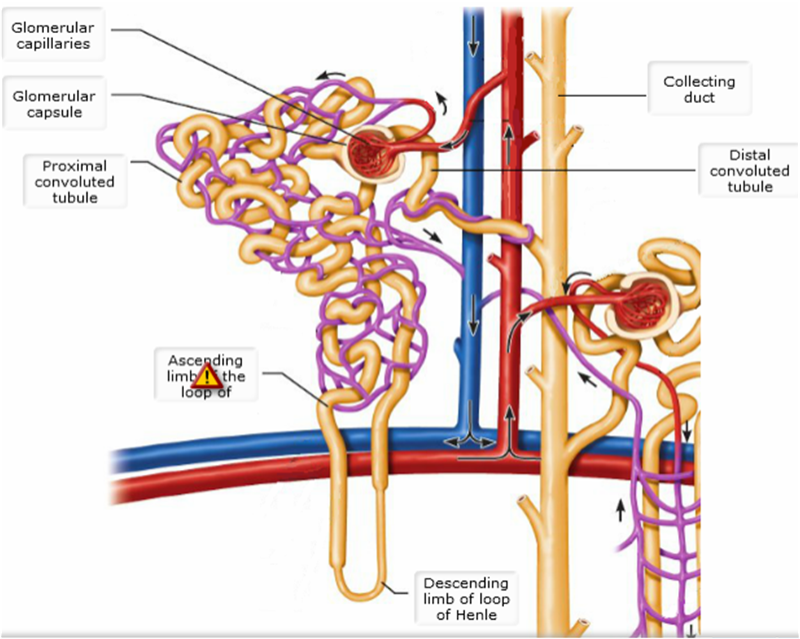 Where does most solute reabsorption occur in the nephron? The _________ is an outer layer of dense fibrous connective tissue that anchors the kidney and the adrenal gland to surrounding structures. The _________ prevents infections in surrounding regions from spreading to the kidneys. Each nephron consists of a _______________, which is a tuft of capillaries, and a ___________. Which of the following congenital abnormalities of the urinary system is found in male infants only? b. air moves up the trachea. c. oxygen molecules move into the lungs, and carbon dioxide molecules move out of the lungs. d. the volume of the thoracic cavity decreases. e. the diaphragm and rib muscles contract. **The contraction of these muscles causes air to enter the lungs. 22 From which structures do oxygen molecules move from the lungs to the blood? 22 Which statement is correct? a. As oxygen diffuses from the lungs into capillaries, blood becomes deoxygenated. b. Carbon dioxide diffuses from the alveoli into surrounding capillaries. c. Oxygen is released from the mitochondria as a product of cellular respiration. d. In the blood, oxygen is bound to hemoglobin, a protein found in red blood cells. e. Oxygen diffuses from large blood vessels into the body's cells. **When oxygen diffuses from the alveoli to the surrounding capillaries, it enters a red blood cell and binds to hemoglobin. a. it does not return to the heart, but goes directly to the lungs. b. it returns to the heart, and is then pumped to body cells. c. it does not return to the heart, but goes to the nose and mouth. e. it returns to the heart, and is then pumped to the lungs. a. uses ATP to move oxygen from blood to body cells. c. is a protein that can bind four molecules of oxygen. d. is found in blood plasma. e. is the site of cellular respiration. Air moves into the lungs because __________. Boyle's law states that volume changes lead to pressure changes, and the pressure of a gas varies inversely with its volume. Alveolar ventilation rate is __________. Hemoglobin has a tendency to release oxygen where __________. In the alveoli, the partial pressure of oxygen is __________. The partial pressure of oxygen in the alveoli is ~104 mm Hg, which is about 35% less than that of the atmospheric PO2. Most of the carbon dioxide transported by the blood is __________. The elastic cartilage that shields the opening to the larynx during swallowing is the __________. The movement of air into and out of the lungs is called __________. Involuntary hyperventilation during an anxiety attack can cause the person to become faint because of __________. Which of the following terms describes the increase in depth and force of breathing that occurs during vigorous exercise? Approximately 20% of carbon dioxide is transported in the blood as __________. Which of the following controls the respiratory rate? Which of the following is NOT a function of the trachealis muscle? It prevents the trachea from collapsing and keeps it patent, despite the pressure changes that take place during breathing. An example of an enzyme located in the lung capillary membrane that acts on material in the blood is __________. Which of the following conditions would NOT cause atelectasis? Airway resistance is insignificant in relationship to gas flow because __________. The transpulmonary pressure is the difference between the __________ and the __________ pressure. **Deformity of the thorax would hinder thoracic expansion and lead to a decrease in the total respiratory compliance. 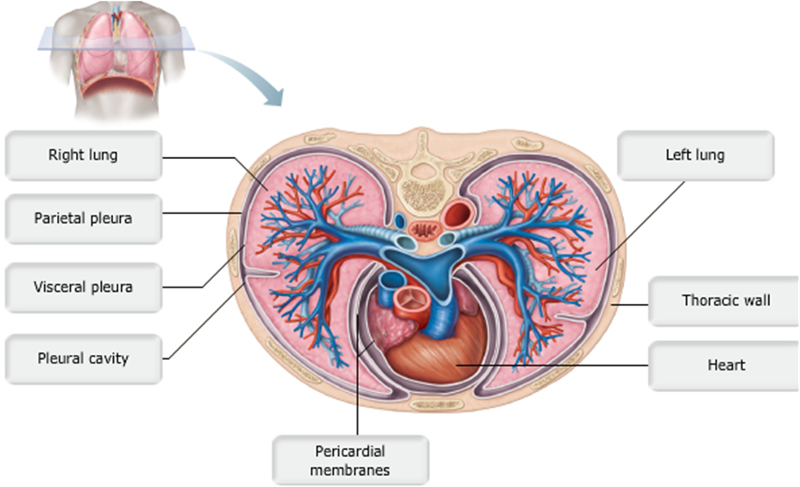 Which of the following nonrespiratory movements would ventilate all of the alveoli? The dorsal respiratory group __________. This is a characteristic of the ventral respiratory group. The pontine respiratory group is responsible for all of the following functions, EXCEPT __________. Which of the following would NOT be found in a "blue bloater"
Micturition is a sacral reflex in infants. It is also called urination. Between ages 2 and 3, descending circuits from the brain have matured enough to begin to override reflexive urination. The most important factor affecting the glomerular filtration rate is __________. When the concentration of ADH increases, __________. Which process results in increased blood pressure in response to hormone release? Arrange the following structures in the correct sequence in which urine passes through them to the external environment: (1) ureter, (2) renal pelvis, (3) calyx, (4) urinary bladder, (5) urethra. If the efferent arteriole constricts while the afferent arteriole remains unchanged, the glomerular filtration rate __________. 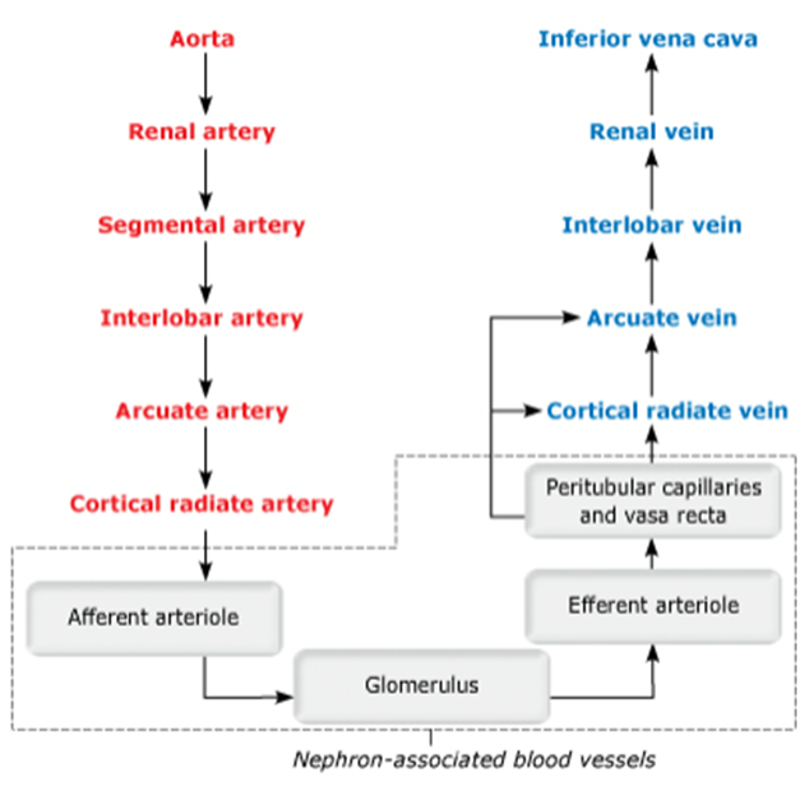 **If the efferent arteriole constricts while the afferent arteriole remains unchanged, the glomerular filtration rate increases. This will increase glomerular hydrostatic pressure. The renal hilum lies on the __________ surface of the kidney. Renal ptosis may lead to __________. All of the following are layers of the filtration membrane in the glomerular membrane, EXCEPT the __________. Which of the following is NOT part of the filtration membrane? All of the following functions are carried out in the renal tubules, EXCEPT __________. All of the following would stimulate the release of renin from granular cells, EXCEPT __________. The energy needed for secondary active transport is provided by the __________. Which of the following is the countercurrent multiplier in the kidney? Urea transport into the medullary collecting duct is enhanced by __________. Which of the following substances is the standard substance used to measure the GFR? Which of the following is NOT associated with primary nocturnal enuresis?